Autoliv's vision of Saving More Lives is the guiding principle to more than 70,000 associates in 27 countries. Each year, our products save over 30,000 lives and prevent ten times as many severe injuries. ​ Autoliv's mission is to be the leading supplier of safety systems for the future car, well integrated with autonomous driving. We are a Fortune 500 company and the world's largest automotive safety supplier with sales to all the leading car manufacturers in the world. We develop, manufacture and market protective systems such as airbags, seatbelts, steering wheels, passive safety electronics and active safety systems including brake control systems, radar, night vision and camera vision systems. We also produce pedestrian protection systems. AutoMobili-D provides an international look on mobility technologies with automakers, suppliers and startups showcasing new innovations and platforms. More than 5,100 journalists and nearly 40,000 engineers, designers and analysts gather annually in Detroit to hear about future developments in the industry, while forging new business and industry relationships. AutoMobili-D is a must attend for those looking to write the next chapter in the mobility industry. Dassault Systémes, the 3DEXPERIENCE Company, provides business and people with virtual universes to imagine sustainable innovations. Its world-leading solutions transform the way products are designed, produced, and supported. We will demonstrate our compelling design and simulation solutions for vehicle conceptual design, improving ride and handling, ensuring seamless connectivity and addressing various challenges associated with electrification. Deutsche Telekom AG is the largest European telecommunications company. Through its office in San Francisco, the Partnering Division of Deutsche Telekom scouts Silicon Valley and the United States in order to identify the best partnering opportunities for the mobile and fixed operators that DT owns in Europe. One of DT's partnering priorities is building a successful connected car ecosystem, in close partnership with Mojio, the leading open platform for connected cars. Mojio provides a secure cloud platform and white-label app solutions, offering operators all of the elements needed to rapidly deploy connected car services, improving thus customer retention, increasing ARPU and attracting new customers. DENSO Corporation is a leading global automotive supplier of advanced technology, systems and components in the areas of thermal, powertrain control, electronics and information and safety.DENSO is one of the largest global automotive suppliers of advanced technology, systems and components, heading toward an automotive society where cars put less drag on the environment and drivers have fewer worries about traffic accidents. We demonstrate edge computing concept for automotive including autonomous driving functions. DNP provides a variety of products and services in a wide range of business fields including display components, electronic devices, decorative materials, and IT solutions to about 30,000 corporate clients around the world. DNP applies world-leading nano-scale fabrication and patterning technologies to manufacture advanced optical films, functional films, and decoration films as well as other cutting-edge products. We also provide software security services for automotive applications. EMD Performance Materials develops innovative high-tech chemicals for sophisticated applications. These include liquid crystals for displays, OLED materials for displays and lighting, effect pigments for coatings and cosmetics, specialty chemicals for the semiconductor industry, and functional materials for solar panels. EMD develops high-tech solutions for the automotive industry that help shape the future of mobility. EMD Performance Materials is a business of Merck KGaA, Darmstadt, Germany. Faurecia's new Active Wellness TM 2.0 seat is positioned to become a vital core component of the cockpit of the future, fusing information from sensors in and around the vehicle seats into an experience that readies occupants for the new realities of autonomous driving. It shows how the cockpit of the future will become predictive through occupant monitoring and data management to ensure comfort and safety in different driving and new mobility modes. FUJIFILM Corporation, a Japanese diversified technology company, provides highly functional materials using the nanotechnology cultivated in its photographic film development for over 80 years. At the Science Fair, Fujifilm demonstrates several functional films for automotive; heat shield and insulation film, EM shielding magnetic sheets, the pressure distribution measurement film, and so on. The HELLA Group develops and manufactures lighting, electronic components, complete vehicle modules and systems for the automotive industry. With more than 6,000 people working in research and development, HELLA is one of the most important innovation drivers on the market. The HELLA Group is one of the top 40 automotive parts suppliers in the world and one of the 100 largest German industrial companies. HELLA Ventures is the corporate venture capital arm of HELLA, solely purposed to provide seed and early stage venture funding to startups. We are passionate about investing in new business models and disruptive technologies that will be the mobility of tomorrow. Increment P North America (IPNA) provides digital mapping products and services to companies, institutions and other entities that need high quality maps of Japan and Southeast Asian (ASEAN) countries. Markets for our products include OEM car navigation, autonomous driving systems, GIS applications and other location based services. Intel powers billions of intelligent devices with an unmatched portfolio of technologies. Now we are applying this expertise to deliver the most scalable and secure platforms for automated driving, enabling OEMs to build rapidly and pursue countless design iterations across brands and fleets. Our efforts span the car, connectivity, and the cloud and data center. ISI-Dentsu of America's SF-based open innovation team will be demoing an Explainable AI (XAI) solution that provides prediction/classification with "the why" (i.e., reasons for the result). We also demo a multi-modal virtual agent that enables the user to interact via text and voice, interprets what the user intends to do across the different interfaces, and finds optimal solutions to accomplish the task. The race to make autonomous and connected cars a reality is on, with component suppliers scrambling to make their mark. Introducing Smart Corner, an efficiently packaged lighting solution fitted with Lidar, cameras, radar, and ultrasonic sensors to enable autonomous driving. Magneti Marelli's Automotive Lighting division integrates the necessary sensing technology to support autonomous functionality within the headlamps and tail lamps, making the most efficient use of space while maintaining stylistic aesthetics and world class lighting performance. Smart Corner provides a turnkey solution for the OEM, reducing manufacturing complexity while cutting costs and weight. Melexis, an Automotive IC Supplier, has developed sensor solutions for advanced HMI and Self Driving vehicle interior awareness: The MLX75123 and MLX75023 QVGA (320 x 240) Time of Flight Chipset can be used for Driver monitoring, Occupancy perception and Pedestrian/Object detection. MLX90640 is a 32x24 Far Infra-Red Array used for accurate temperature measurement and thermal imaging of the vehicle interior for HVAC and ADAS applications . Mentor's consolidated ECU architecture for premium audio and video in-vehicle experiences is paired with high performance Socionext graphics for advanced infotainment and instrument cluster functionality. Built on Intel Apollo Lake hardware, Mentor's Type-1 hypervisor and Linux-based ConnectedOS, the demo enables vehicle cost reduction while still maintaining separation for robust implementations and ISO26262 safety. For solving thermal design and reliability challenges in autonomous vehicle sensors, processing units, ECUs, to infotainment systems and EV power electronics earlier in development - Mentor provides leading electronics cooling simulation software (FloTHERM), 1D & 3D CFD software (FloEFD + FloMASTER) and semiconductor thermal characterization & reliability test equipment (MicReD). Nextchip is a fabless company that is specialize in embedded vision applications from video surveullance to automotive. Founded in 1997, Nextchip has been successfully operating its business, gaining market trust and recognition in imaging market. 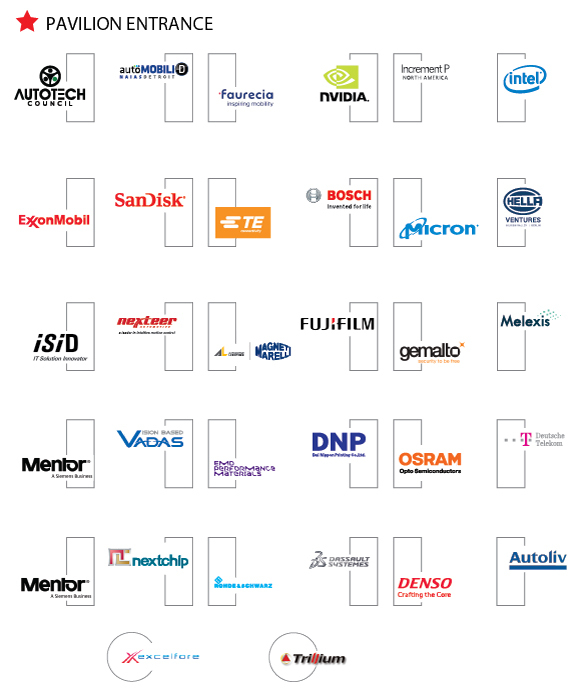 To meet market demand that is fast-changing, Nextchip actively works with world's renowned manufactures, semiconductor companies and IP providers to ensure the quality of imaging systems. Competitiveness - Highly specialized in embedded vision processing technology segment with 20 years' business experience. - R&D based HR w/ more than 80% - Having more than 47 patents in regards to image processing technology - Possessing a wide range of product portfolio from video surveillance to automotive. Leader in Intuitive Motion Control Nexteer Automotive is a multi-billion dollar global steering and driveline business delivering electric and hydraulic power steering systems, steering columns, driveline systems as well as advanced driver assist systems (ADAS) and autonomous technologies for original equipment manufacturers. The company's global workforce of over 13,000 serves more than 50 customers in every major region of the world. The company has 21 manufacturing plants, five regional engineering centers and 11 customer service centers strategically located in North and South America, Europe and Asia. Nexteer Automotive's customers include BMW, Fiat Chrysler, Ford, GM, PSA Peugeot Citroen, Toyota and VW, as well as automakers in India and China. Autonomous vehicles require Artificial Intelligence to navigate a nearly infinite range of possible driving scenarios. NVIDIA AI platforms offer a cloud-to-car solution, with NVIDIA DGX™ systems training deep neural networks in the datacenter, and NVIDIA DRIVE™ PX running in the car to process sensor data and drive safely. NVIDIA works with the world's leading automakers, including Toyota, Mercedes-Benz, Audi, Volvo, and Tesla to revolutionize the way people drive, and empower vehicles to drive themselves. More information at http://nvidia.com/drive. OSRAM Opto Semiconductors is a global leader in providing lighting solutions that take innovation to new limits including sensors, infrared and laser lighting. Our products are used in a wide range of applications from virtual reality to autonomous vehicles and mobile phones to smart lighting for buildings and cities. This year we'll be highlighting mostly (but not exclusively) test solutions that address the telematics space. With the upcoming eCall mandate in Europe and the need for ever increasing wireless speeds in every market, Rohde & Schwarz will be bringing test equipment to address the needs of engineers who are both designing and qualifying that technology. The CMW500 Wideband Radio Communication Tester is both generator and analyzer. It's designed to test wireless technologies including WiFi, Bluetooth, and cellular standards including LTE, WCDMA and GSM. The SMBV100A Vector Signal Generator can generate a variety of automotive test signals including GNSS (satellite) as well as various 3GPP standards. The SMW200A, also a vector signal generator, has various R&D features including various fading profiles to test real-world effects on various RF signals. The TSMW is an RF capture device that allows engineers to capture real-world signals in the field to bring them back into the lab for testing. The IQR is an IQ recorder designed to take the content from the TSMW for playback in the lab. Both the TSMW and IQR can be used to capture 802.11p (DSRC) and cellular signals. Finally we'll be bringing some of our digital oscilloscopes that can be used for both automotive bus testing and EMI debugging. Western Digital is an industry-leading provider of storage technologies and solutions to create environments for data to thrive. Requirements for autonomous vehicle applications including data recorders, ADAS, and safety systems are demanding more robust data storage environments that NAND flash solutions can support. Automakers, tier-1s and mobility service providers must take part in the definition of future data environments. TE's unmatched breadth of connectivity and sensor solutions, proven in the harshest of environments, helps build a safer, greener, smarter and more connected world. Our products connect nearly every electrical function in cars—from alternative power systems to infotainment and sensor technologies. Our 50-plus years of experience in automotive connectivity and high voltage power enables our customers to stay close to evolving trends such as safety, the environment, and lifestyle preferences. We help our customers overcome engineering challenges to deliver reliable and faster data, navigate new architectures to handle extra features and power demands, or turn a concept into the vehicle of the future. Trillium is a leading provider of transportation safety & information security solutions, including lifecycle protection for connected vehicles through a Security SaaS offering. Its advanced IoT & cybersecurity software consists of lightweight encryption, authentication, cryptographic key management, IDS/IPS, secure OTA updates & data convergence technology. Trillium also targets aerospace, industrial automation, medical and robotics applications. VADAS Co., Ltd is a R&D software company in South Korea leading the development of vision-based ADAS (Advanced Driver Assistance Systems). Through our expertise in vision signal processing and deep engineering skills, Vadas has been able to provide high-quality Surround View solution and other vision-related technologies to various automotive suppliers.